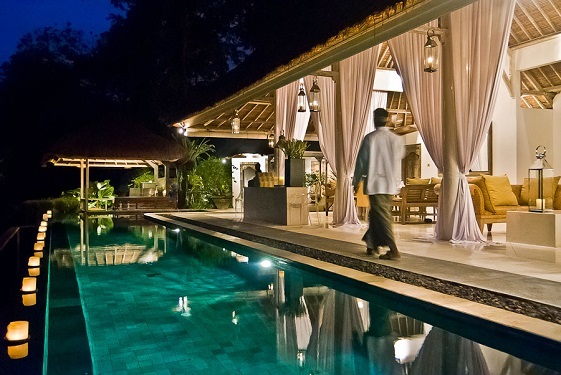 BALI HAS A number of beautiful private villas, but this is one of the best. Imagine five star resort service - then imagine that service all to yourself in a villa with the amenities of a top hotel - that's Villa Sungai. Yet this isn't one of a complex of villas, not a villa within a hotel, but a truly private 'one-off'. So it fits The Luxury Travel Bible's exacting definition of "private" perfectly . Tucked-up on a hillside on the south-west coast, near the village of Cepaka where a brace of other upmarket and luxurious villas have also sprung up away from the hustle and bustle of downtown Denpasar this villa hugs the cliff a amid palm and bamboo above the Penet river. Walk down the steep steps and through the double wooden doors and you are in your own private pavilioned world. So yes, there is privacy, and yes there is lush tropical scenery, not to mention three pavilion style bedrooms adrift in clouds of mosquito nets and inside/out bathrooms, but it's the anytime/anywhere style service courtesy of the discreetly dedicated staff that will max the pleasure principle of your holiday. Rooms are service twice a day, the bathrooms have Bulgari amenities, and staff bring you drinks by the pool. So relax there is nothing to do but enjoy yourself. A dining table in the open pool pavilion can seat fourteen so this is the perfect place to invite others to share your personal paradise for dinner or a cocktail party, especially as the villa has a full time chef. The villa is privately owned by Australian Pamela Hayes and she has made sure that beyond the all day dining and bar there is someone to book you into the best restaurants, or organise any activity (and drive you to it in your private 8-seater vehicle) from white water rafting to shopping. Then of course there's the poolside massage... sublime. For a very discreet retreat choose Sungai Gold, the one-bedroom baby sister of the larger Villa Sungai. It too has airy open sided pavilions, curling foliage all around it and the sound of the river below. Day beds, plunge pools, and net-swathed beds all whisper romance. Perfect for honeymoons or elicit assignations of all kinds.